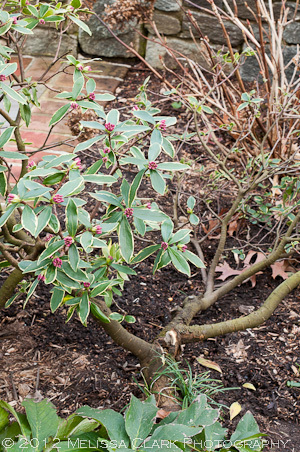 About ten years ago, when I redesigned my front yard, I planted a winter daphne (Daphne odora ‘Aureomarginata’) in front of the seating area under my now-departed crabapple tree. Visible just behind the weeping yew in the front of the photo, my daphne has persevered through all kinds of weather, including snow in April 2007. I planted it because I had a shady front yard, a high-profile location I wanted to fill with a specimen plant, and most of all because I loved the way this plant smells when it’s in bloom, usually in late March or early April. Heavenly. What I didn’t know at the time was that very few daphnes grow to maturity looking like the one in the link here. Many, if not all, of the ones I’ve planted or encountered, develop a strange tendency to start growing horizontally. 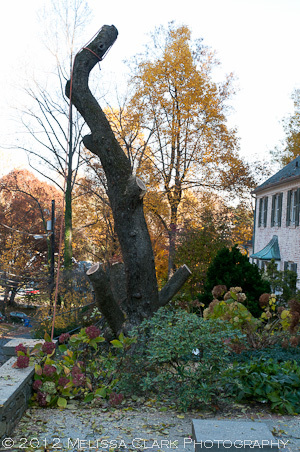 Mine is so “sideways” now that much of its “trunk” lies on the ground, and most of the foliage branches are propped up on the flagstone landing in front of the bed. Recently, a deer (I think) stepped on it in the center, breaking off a big chunk of the shrub. Ouch. 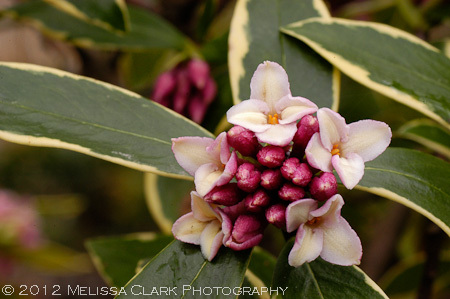 Whatever roundish shape the daphne had before has been severely compromised, to say the least. I winced and cut off the broken branch, then tried an experiment to see if I could “force” cuttings from the broken piece to bloom inside. No luck, as you can see. This is as good as it got. A couple of days later, the leaves started yellowing and falling off, while the buds stayed determinedly shut. Over the years, as my daphne has gotten older, harsh winters have made me think it’s about to give up the ghost. 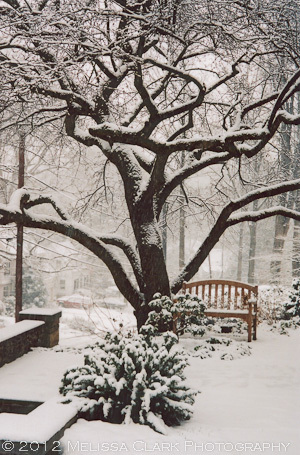 In a real snowstorm, shortly after it was planted. Plucky little thing. But to my surprise, when bloom time comes, in late winter, it perks up and lets forth with its gorgeous scent, determined to give me another season of bloom. My daphne's buds, starting to open. 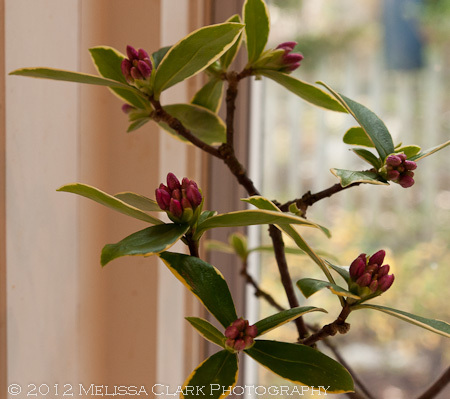 Now that my front yard is sunnier, I don’t know if the daphne will survive the sun’s onslaught. No longer sheltered by the crabapple's branches, the daphne will now get strong sun in the front yard, even though it faces north. Check with me this time next year. I would hate to have to move it, but if it proves necessary, I’ll try transplanting it, broken branch and all. After all, it’s surprised me before with its determination to survive. Perhaps it will do so again. Fingers crossed. 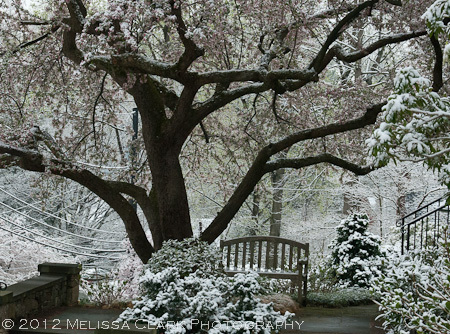 Not far from where I live, in northwest Washington DC, American University has been establishing an arboretum on its campus that provides student, faculty and visitors with a garden-like setting to enjoy and take pride in. 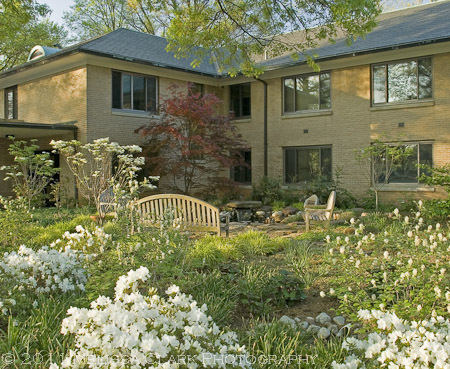 I’ve been photographing the campus for its landscape architect, H. Paul Davis (who also has designed many beautiful residential gardens in the DC area) since 2004, and thought I would share some photos with you. While the original campus plan for AU (which was founded in 1893) was created by Frederick Law Olmstead Sr., it underwent changes over the years. These days, Olmstead’s plan is being revisited, but some of the most visually exciting areas of AU’s landscape are directly attributable to Davis’ vision. 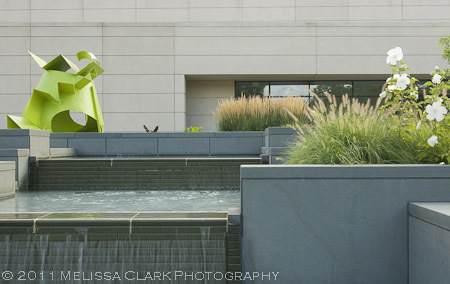 The University's Katzen Center, with sculpture and plantings. 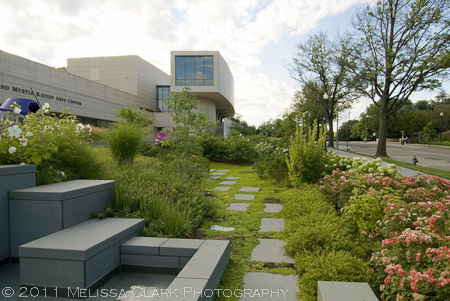 Another view of the Katzen Center "garden." Azaleas and a brook near the Woods-Brown Ampitheater at AU. Roper Pocket Park, with a naturalized pond and seasonal plantings. 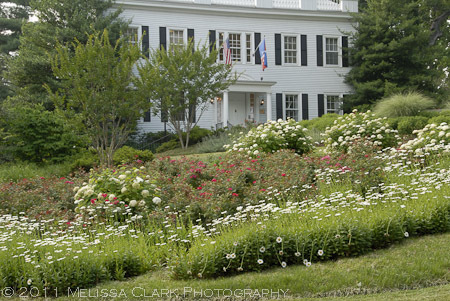 and large expanses of lushly planted sweeps of colorful long-flowering perennials in front of the President’s House and neighboring Glover Gate. The lawn at the President's house, near Glover Gate. 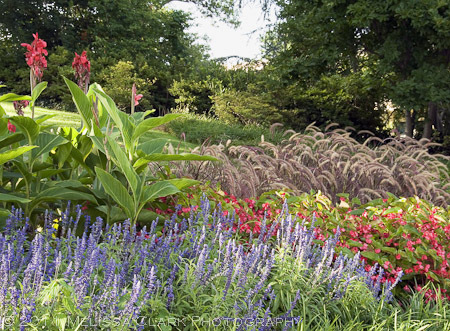 A mass of bold summer annuals and grasses capture the eye at Glover Gate. 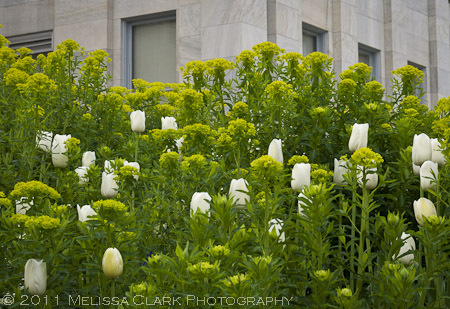 In spring, I found Euphorbia paired with luscious yellow and white tulips along a walkway between buildings. Euphorbia and yellow and white tulips provide a gorgeous spring combination. The landscape design around academic buildings is impressive almost everywhere. Hillside plantings behind a Batelle-Thompkins building, not far from Glover Gate. 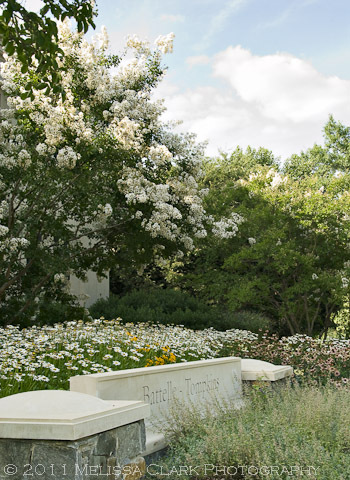 A late summer afternoon in front of Battelle-Tompkins, with a Natchez crape myrtle in bloom and masses of coneflowers, shasta daisies and black-eyed susans. 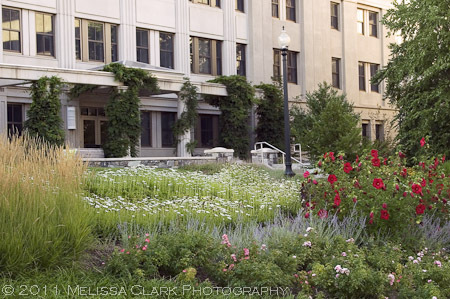 In 2010, the plantings surrounding Battelle-Thompkins earned Davis and AU a Landscape Design Merit Award from the Perennial Plant Association. 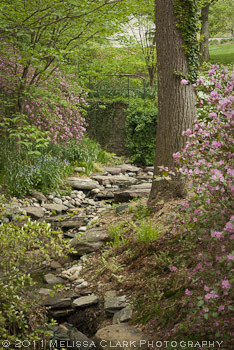 AU’s arboretum is not only visually beautiful but is becoming a leader in sustainable management of an urban landscape. Its new LEED Gold Certified School of International Service building showcases a host of new green technologies, and the campus’s Media Production Center boasts a green roof. If you’re in the area, I hope you’ll take a tour of the campus – even if you’re not in the market for a return to academia yourself, it’s inspirational and an opportunity for learning more about how an institute of higher learning has something to teach us all.